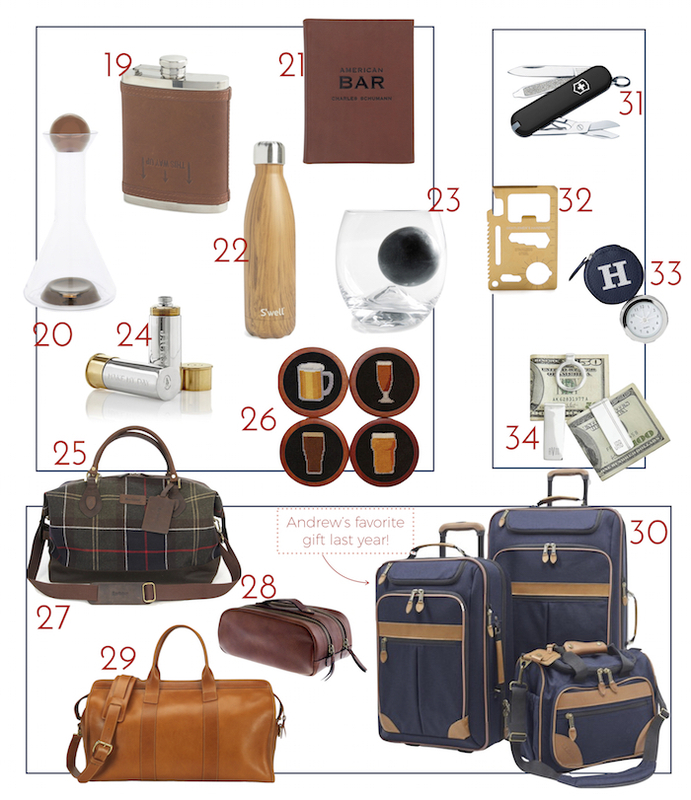 Yay for gift guide season to be upon us! 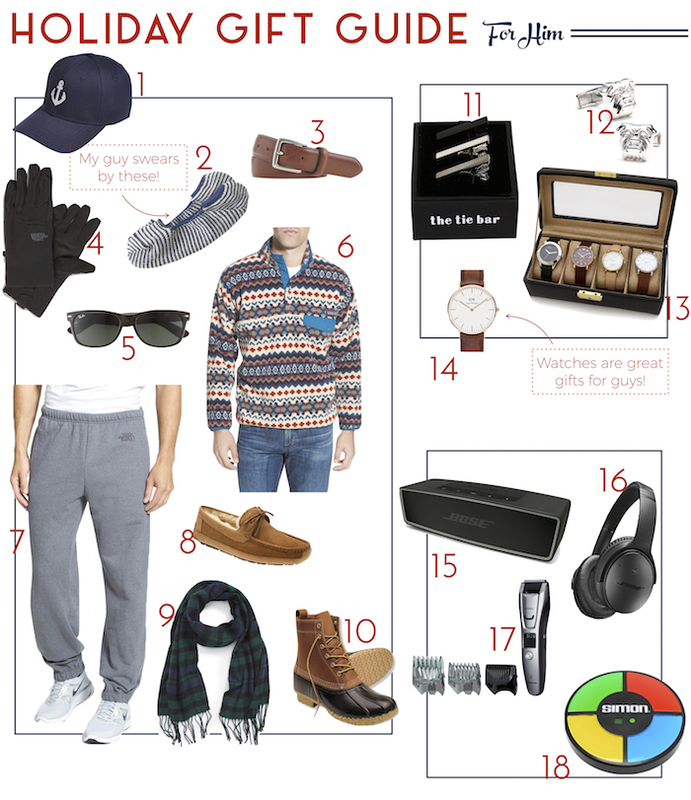 Today we start with the hardest one: what to get your guy. Whether it's your dad, your uncle, your brother, your husband, your boyfriend, the in-laws or even the guys who have everything... I have you covered. Best universal gift for a guy: A watch. This is the easiest (and best) present for any guy in your life-- your dad, brother, husband, boyfriend... anyone! It's great because they come in all price points, they're a good investment and they will be worn daily. The DW watches are my favorite for a guy for price and style. Already has too many watches? Give him the gift of organization-- a watch case! Best bang for your buck: Bluetooth speaker. Everyone listens to music, now you can listen in style. Bluetooth speakers are great for any occasion and are one of those things you never knew you needed until you have it! Most unique: The credit card tool (only $15). This gift is SO fun! It's a knife, wrench, sawtooth blade, can opener and ruler all in one! Such fun little all purpose tool and for the price, it really can't be beat. Want to go a little more mainstream? Pick up this swiss army knife for $20! Most fun: Simon ($25). Duh! Bring him back to his childhood with this fun game that everyone can play with. Make it a little more adult by creating a drinking game around it. Best under $100: Waterproof tech gloves ($45). Everyone needs a good pair of warm gloves that are also tech friendly for the winter. Your guy will thank you! Best under $50: Whiskey sphere and glass set ($25). What a fun gift to give any guy who loves his whiskey! Usually the rocks are $25 a piece but this is a two-for-one combo with the rock and glass. Can't go wrong! Best under $25: Plaid scarf ($25). I love a guy who rocks a nice plaid scarf. Keep him warm and fashionable all winter long. I love that Swell water bottle! Indeed! Looking gifts for men is not that easy, we need more time to think on what to buy and where to buy. And yes! thanks for sharing your gift ideas. Some of these items can personalized with custom etching and engraving from perfect etch .